SONOMA, Calif. — Weather conditions fueling mammoth wildfires in Northern California that have killed at least 23 people will not let up for days, and fire officials warned Wednesday that the emergency will get worse before it gets better. The coroner's office in Sonoma County reported two more deaths Wednesday night, raising the numbers of people killed there to 13 and to 23 statewide. 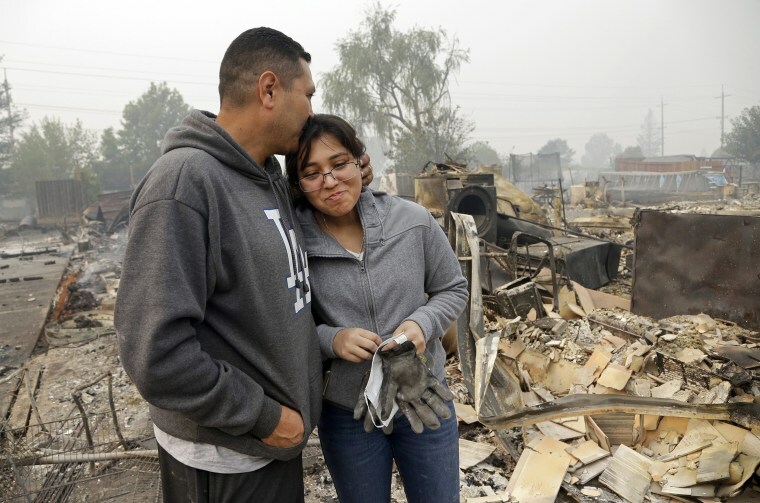 "You all know the weather conditions — we're going to see these conditions continue for the next several days, minimum," Ken Pimlott, director of the California Department of Forestry and Fire Protection, or Cal Fire, said at a news conference in Sonoma County, where most of the deaths have occurred. "And we're planning for that, we're staffing for that. But it's going to be a long haul." Firefighters in California are battling 22 large fires, which have burned more than 170,000 acres in the last two days and destroyed an estimated 3,500 structures. But the focus is on two large fire complexes burning in Sonoma and Napa counties, Pimlott said. Sonoma County Sheriff Rob Giordano said authorities were still looking for 285 people reported missing. Of 600 people reported missing, 315 have been found safe, he said. Chris Benziger of Benziger Family Winery in Sonoma County was among those who fled for their lives ahead of the fire. He and his family left their home in Glen Ellen after the so-called Nuns Fire erupted Sunday. The home was destroyed, but the winery a few miles away was safe. "We were so lucky to escape with our lives," Benziger, who returned to find his home destroyed Tuesday, said in a phone interview. "The fire, it started in Nuns Canyon, not even a quarter-mile from our house. so we had absolutely no warning." Benziger said his family was in bed at around 11:30 p.m. Sunday "and our house was shaking from the wind." "You could hear branches breaking," he said. He heard a yell and smelled smoke, and "I went to the window, and that's when I saw the glow." "I got everyone up and said, 'We've got to evacuate, we've got to get out of here.'" Benziger said. He sent his elderly in-laws, his wife and his two boys, ages 14 and 18, ahead by about five minutes, but as a former volunteer firefighter, he stayed behind to try and save the house. "Being a fireman for so many years, I thought I'd be the guy hosing things down from the roof, but everything just happened so fast," Benziger said. He watched as his neighbor's house exploded in flames and his hedges caught fire. "Both sides of the street were on fire. It was like you see in the movies," he said. "You never think it's going to happen to you." Evacuation orders were in place in several communities threatened by the fires Wednesday. Citing worsening fire conditions, authorities expanded a mandatory evacuation order Wednesday afternoon to include the entire town of Calistoga in Napa County, which has a little more than 5,000 residents, according to census data. In Sonoma County, the community of Geyserville was added to those under mandatory evacuations, and an evacuation advisory was issued for Boyes Hot Springs and the north side of Sonoma. Sonoma Valley High School in Sonoma, a city of over 10,000, was serving as an evacuation center. An estimated 250 to 300 people, many of them elderly and with nowhere else to go, were staying there Wednesday night, school district Associate Superintendent Karen Strong said. The building is nearing capacity, she said. Collectively, the fires are among the deadliest in the state's history. The last single fire to kill as many people was San Diego County's Cedar Fire in October 2003, which destroyed 2,200 homes and was started accidentally by a hunter. Giordano said that those in evacuation areas should heed the warnings. "This is about saving lives," he said.